You are here: Home / Events / Is there Cash In Your Attic? They’ve joined forces with antiques TV star Colin Young (from Bargain Hunt, Flog It! and Cash in the Attic to name but a few) and auctioneers Golding, Young & Mawer to uncover unused and unwanted treasures which could be donated to raise money for a great cause – the Boultham Park Capital Appeal. If you have collectables, china, paintings, furniture etc. 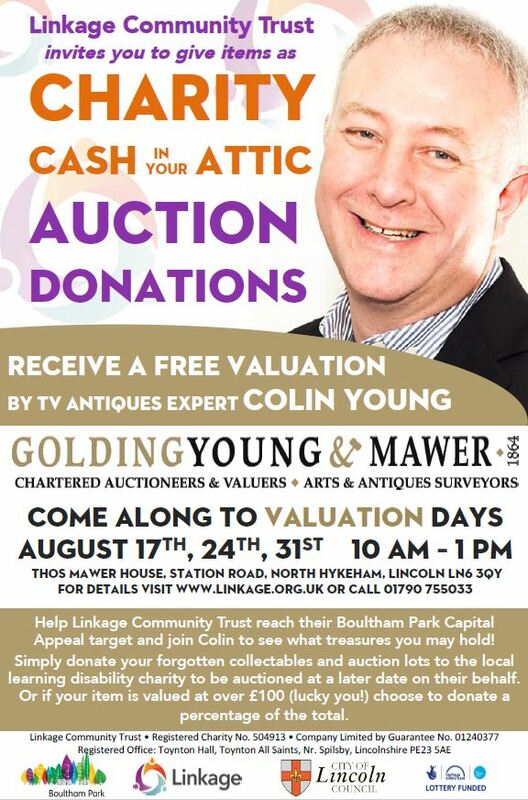 that you are willing to donate, come to one of the valuation dates to have your item/s valued by Colin for free. After providing a valuation, Colin will suggest a future auction date for the item to be entered in. If you are lucky enough to have an item valued at over £100, you can decide what percentage of the sale price you would like to donate. The money raised from donated auction lots will go to Linkage to help reach their Boultham Park Capital Appeal target. So, donate your unwanted items, get the item valued by a TV celebrity, enjoy the thrill of an auction and help a charity. Colin Young will be providing free valuations between 10am and 1pm, at Thos Mawer House, Station Road, North Hykeham, Lincoln, LN6 3QY on: * Friday 17th August * Friday 24th August * Friday 31st August. All you need to do is have a rummage around at home, let Linkage know which valuation date you would like to attend, and turn up on the day to enjoy the fun. It’s as simple as that. Linkage are asking you to donate your items to them. Once valued they will be sold on behalf of Linkage, not the individual who donated them. As mentioned, if the item is valued at over £100, you can choose what percentage of the sale price you donate to Linkage. When will the item be entered into an auction and can I go? Golding, Young & Mawer hold different types of auctions, specialising in different items, so Colin Young will suggest which auction he thinks the item will raise the most money in. The auction date is likely to be at some point before October but it completely depends on the lot. You are most welcome to go along to the auction to see how much your donated item makes but Linkage will let you know the outcome after the sale anyway. What happens on the valuation day? When you arrive, someone from Linkage will meet and greet you. Once they’ve taken some details, you’ll be directed to TV’s antique expert Colin. Colin will value the item and suggest which auction sale the item should be entered in. Linkage will take a note of the date and time of the auction and the valuation price while a porter takes the item and marks it up as Linkage as a vendor. Golding, Young & Mawer will store the item until the sale day. How do I book a valuation date and time? Linkage are not able to provide a time slot on the valuation days which means you can turn up at any time between 10am-1pm. They would ask though that you let them know which day you would like to come so they can ensure you don’t have too much of a wait. To book email fundraising@linkage.org.uk or call 01790 755033. If you have any questions please contact Sophie Tuplin or Barbara Moulson on the details above.